One of the weekly handwork crafts we enjoy doing during the day home together is beeswax modeling. Beeswax modeling is a wonderful way to work with your hands and manipulate soft wax, a creative and sensory experience for any age. It is an art form we picked up from our Waldorf curriculum this school year and is a beautiful way we use our imaginations as the heat of our palms warms the wax into fun little creations. Theodore enjoys making snakes and trucks and planes complete with loud motors and hisses. Stella is into flowers, fairies, and letters, leaning on things she has picked up at school. And Alfie, well is at the stage right now of observing and placing bits of wax in jars and snacking alongside. It’s really a great family craft if you’re looking for a new way to engage your children alongside you as you work with your hands. I ordered our sheets of colored beeswax from this website which is brimming with really wonderful toys and tools etc. if you’re looking for other ideas! The wax is just as sweet and fragrant as we hoped it would be. Stella has helped me roll beeswax honeycomb taper candles before which is also a great handcraft practice, but being that Theo is still a quite small, he hasn’t been able to do that just yet. Beeswax modeling however is just perfect for him (he just turned 3). He took to it right away with all the bright colors we have to work with. Usually we’ll sit together in the kitchen listen to music, making fun shapes and objects. I’ve been starting to use the beeswax to tell stories which is always entertaining for them. Stella has these stunning board books by Gerda Muller that are open for both interpretation and imagination as you and your little ones are lead through the changing of the seasons. I think they are the perfect books to accompany such a craft! You could open the books and have the kids choose a few fun things to mold such as a left or star or you could play storyteller and make some objects to go along with your story. A few things to note when getting started. It’s important to know that if your wax is really cold and hard (which it almost always is) you should heat up some water and let it take a soak before molding it. I like using our enamel tin for this because it keeps in the heat longer than a regular old bowl, but any container will do. A good thirty seconds in the warm water will make it extra pliable. Often times I’ll show the kids how to do something, like how to shape the beeswax into a ball or a long slender tube. They like imitating me and go from there. Beeswax is also a great way to help your little ones learn their colors. By simply saying something like, “Can you please pass me the blues or warm colors?” to your child, they will pick their colors up in no time. Stella and I had fun making letters the other day after school, taking turns spelling out names that she knew in her favorite shades of red. The possibilities are really rather endless and the beeswax hardens so it will keep for a long time. When you want to work with it again, soak it in warm water and begin! 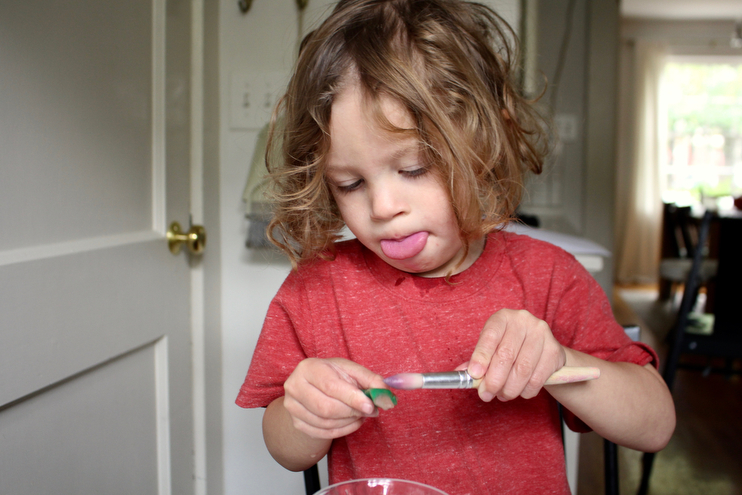 Another fun thing for the kids to try is to let them paint the beeswax with warm water. You can see Theo doing this in the pictures above. It doesn’t really warm the wax up per se, but it’s a sensory activity nevertheless that he loves doing. And for those who are interested in the art of working with one’s hands here’s a short video on the subject. It’s is about the natural and cosmic kind of grounding that we can enjoy when working with our hands along with the beauty that we are able to create by doing such meaningful tasks with our palms and fingers. Personally, I take so much delight in simple, purposeful handwork and it’s always a treat when I come across something by someone who values this just the same. Handwork, such as knitting, painting, molding, coloring, and sewing to name a few, are simple ways you can weave intentional practices into your day at home. For me it’s not about mastering the art form but rather using my hands to find beauty in the process of whatever it is that I am doing. We have a large craft cupboard full of things to do with our hands, something I’ll be showing you here quite soon. I like dabbling in several things throughout the week while the kids are napping or playing alongside me. I’ll do things like making a pot holder or sew a pillow case (something I’ve just learned) or a paint a watercolor with the kids. I don’t mind the starting and stopping and the picking one up and leaving off. I let the rhythm of the work flow organically because that’s what mothering babies at home allows me to do right now. Have you ever tried to have a conversation with another mom during a playdate? Yeah, it’s sort of like that haha. I always look forward to being able to return to my project another time when feeling inspired or when needing to sit down, slow down, and recharge. I also cherish the colder seasons for this very reason, for they encourage a coziness that handwork just fits alongside so splendidly. I cannot wait for our first fire in the fireplace so we can gather round and watch old episodes of The Office and I can knit the kids a new scarf for winter! I am going to be sharing some other handwork crafts throughout these next two seasons, just some fun things you and your little ones can do together while watching a movie or unwinding after supper. 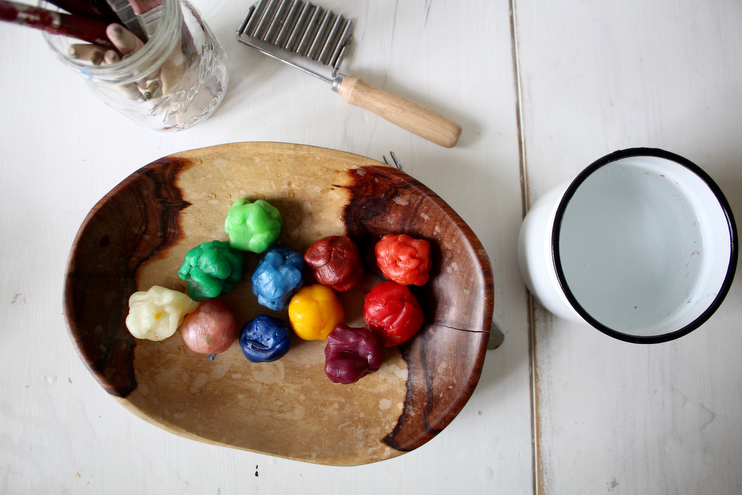 Bread making, rock painting, and playing with play dough are other great handwork ideas you can practice with your children that I’ve shared in this space. You can also find some more handmade items here in this series of my blog. What handwork crafts do you enjoy doing either alone or with your kids? Have you felted before? I’ve got some in the mail and cannot wait to give that a try! 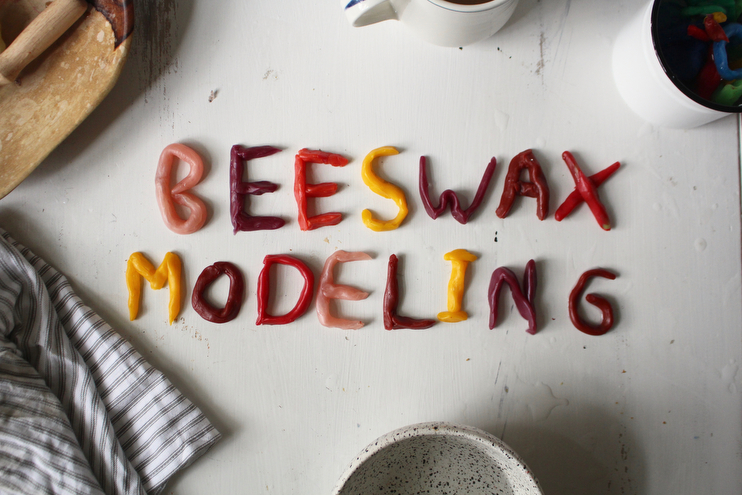 Also, click here to watch a great tutorial on beeswax modeling if you are more of a visual person like myself. Enjoy! Thanks for sharing all of these great handwork ideas! I got the Whole Family Rhythms Autumn guide and have been considering the beeswax modeling. Do you find it hard to clean up? Does it stick to the floor/table at all? I’ve struggled with all kinds of modeling clay and dough and even play-doh brand and find that these get ground into the floorboards easily. Where can I buy modeling beeswax?